baby couponing at Walmart formula deals Walmart Walmart Gerber Soy Baby Formula $0.28 with Super High-Value Coupon!! 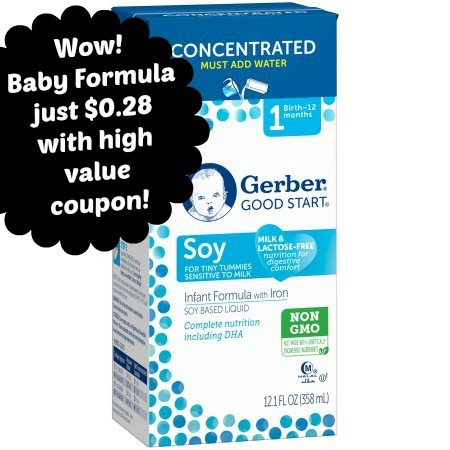 Walmart Gerber Soy Baby Formula $0.28 with Super High-Value Coupon!! Don't wait to print this one as I'm pretty sure it will not last! Hurry on over to Coupons.com and print a new, high value coupon valid to save $5 on any 1 Gerber Formula with NO size restrictions (expires 30 days from date of print)! If you use expensive Soy Baby Formula, you can really stock up with this coupon!! Be sure to ask family & friends to print this coupon for you too! Check if your store carries this by entering your zip code here. Looking for more Walmart deals, click here! LOVE Walmart deals? Be sure you join our Facebook group here!